Recognizes a protein of 95 kDa, which is identified as Bcl-6. Raji or Ramos cells. Tonsil or Hodgkin’s lymphoma. Recognizes a protein of 95 kDa, which is identified as Bcl-6. Antibody to bcl-6 is helpful in a number of diagnostic settings: (1) In the differential diagnosis of small B-cell lymphoma. Follicular lymphoma will show bcl-6 (and CD10) positivity whereas other small B-cell lymphomas are usually negative. (2) Bcl-6 is an important prognostic marker in diffuse large B-cell lymphomas (DLBCL), where CD10, bcl-6 and MUM1/IRF4 are used to identify germinal center and activated B-cell phenotypes. (3) Bcl-6 can be valuable in distinguishing classical Hodgkin lymphoma from nodular lymphocyte predominant Hodgkin lymphoma (NLPHL). The Reed-Sternberg cells of classical Hodgkin lymphoma are bcl-6 negative whereas the large (L&H) cells of NLPHL are bcl-6 positive. 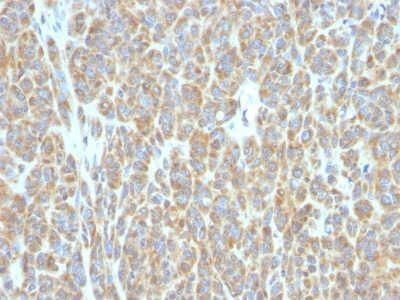 In contrast, anti-Bcl-6 rarely stains mantle-cell lymphoma and MALT lymphoma. Catalog number key for antibody number 0850, Anti-Bcl-6 (BCL6/850) The prefix indicates conjugation, followed by the antibody number and size suffix.